Utility kilts are certainly making their mark, especially amongst the younger generation, but don't think you have to be young to wear one, you don't. So what exactly is a utility kilt, and how do they compare to traditional authentic Scottish kilt. Well the first thing to say about them, is that they are designed primarily as casual wear. But you can wear a traditional kilt in a casual manner, I hear you say. That is of course true, a traditional kilt is such a versatile garment that it can be worn virtually anywhere. However these kilts are only loosely based on the traditional kilt, and the fabrics used in their manufacture tend to be much lighter, such as cotton for example. There is a lot less cloth used in one of these kilts, compared to a traditional kilt, and the pleats are much shallower, and fewer in numbers. The first photo I have to show you is of a utility kilt manufactured in America, note the two large cargo pockets, something unheard of on a traditional kilt, but practical nonetheless. But you don't have to be in America to buy such an alternative kilt. There is a very well known kiltmaker in Edinburgh, who is becoming somewhat famous for his innovative kilt designs. The one you can see below has been based on a very famous fictional character, namely Superman. 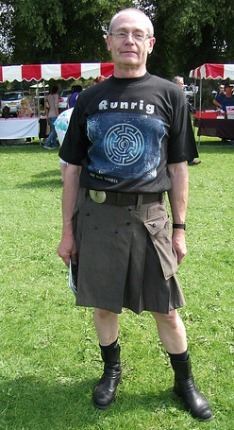 This kilt as you can see also has two very large cargo pockets, and is being worn below the knee, which is another modern trend. The next example to show you is yet another kilt from the same Edinburgh kilt maker. This time he has designed the kilt using a camouflage material, but once again he has included two cargo pockets, this time sewn in at an angle. This kilt as you can see is being worn to the middle of the knee, as you would wear a traditional kilt. 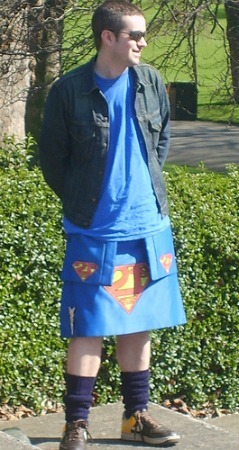 The last kilt I have to show you is also from a British manufacturer, who produce utility kilts from denim and leather. The one you can see below is actually made from corduroy, and is marketed as a hill walker kilt. Again the large cargo pockets, and you have a good view of the pleats. You can see they are not nearly as deep as the pleats on a traditional Scottish kilt. Which is one of the reason they do not hang so well, the other is that the material is so light. So now that you have had the chance to look at a selection of utility kilts, I hope that it will make your decision easier, as to whether one of these kilts is right for you. You will have seen from the photos that these kilts are fine for casual wear, and indeed quite practical for many casual occasions. Where they cannot compare to a traditional Scottish kilt, is in a formal setting. This is of course is where a real kilt is unique, in as much as you can dress it up as well as down, something you cannot do with a utility kilt. However I don't believe the two kilts are competing in the same marketplace, and there is certainly room for both of them. As more and more men are discovering the joys of wearing kilts, whether utility, or more commonly traditional. If you would like any further information on the kilts featured on this page, or anything to do with kilts in general, then drop me a line using the contact us form and I will be delighted to help.